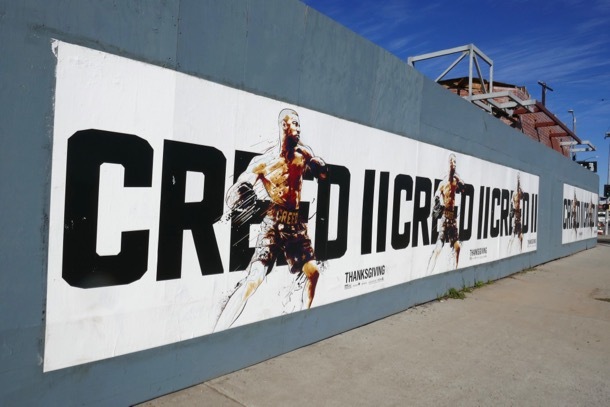 2018 has been a very good year for Michael B. Jordan, he started the year with a standout performance as the villainous 'Erik Killmonger' in Marvel Studios global success Black Panther and this November he'll reprise his role as 'Adonis Creed' in the sequel to 2015's boxing drama, Creed. 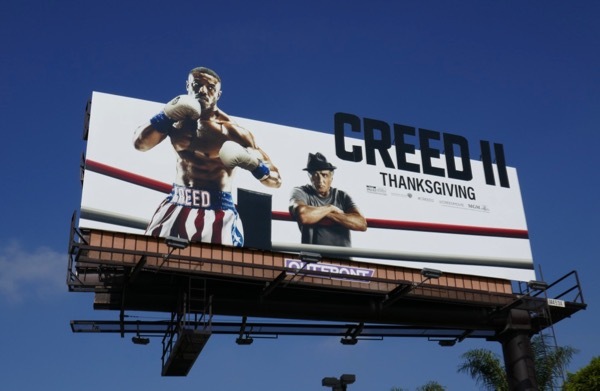 Continuing the story of Sylvester Stallone's 'Rocky Balboa' (who earned a Supporting Actor Oscar nomination for the rebooted franchise), the film sees the two-time world heavyweight champion continuing to train and mentor the son of his rival-turned-friend, 'Apollo Creed'. 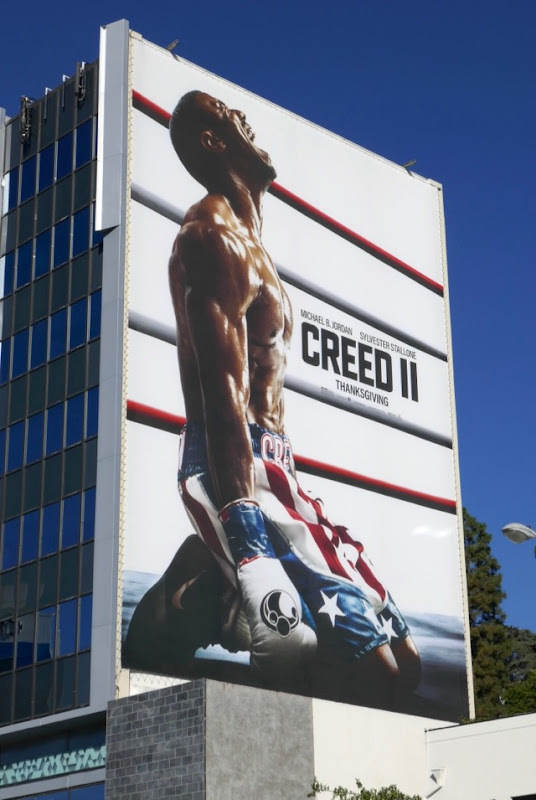 This time around "Donnie" Creed has to the chance to avenge his father's brutal death in the ring by facing the son of Dolph Lundgren's 'Ivan Drago', 'Viktor' (played by Florian Munteanu). Both fighter and trainer facing ghosts from their past. 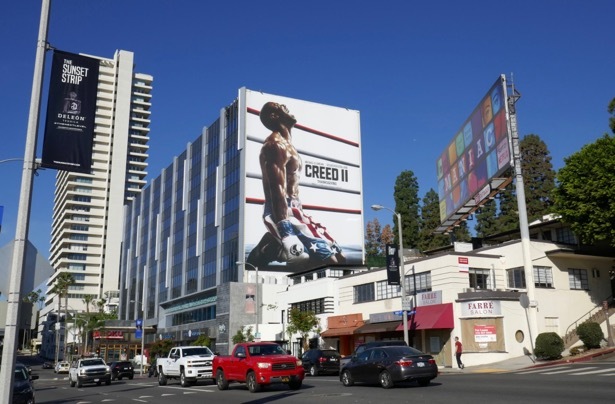 These giant-sized and extension cut-out billboards were photographed along the Sunset Strip, Cahuenga Boulevard and Santa Monica Boulevard from November 1 to November 8, 2018. 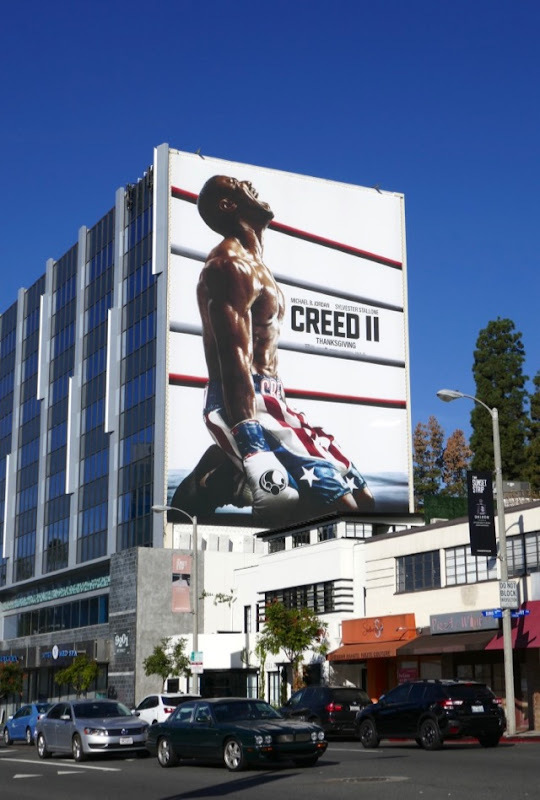 As a special bonus here's also two billboards for the first Creed movie snapped along the Sunset Strip and Wilshire Boulevard from December 1 to December 9, 2018. 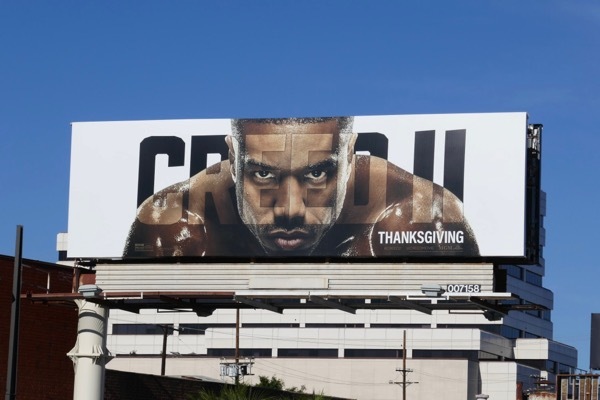 Michael B. Jordan admirers can also enjoy these Fantastic 4 movie billboards, these Fahrenheit 451 film billboards, these That Awkward Moment billboards and this giant Black Panther movie billboard. 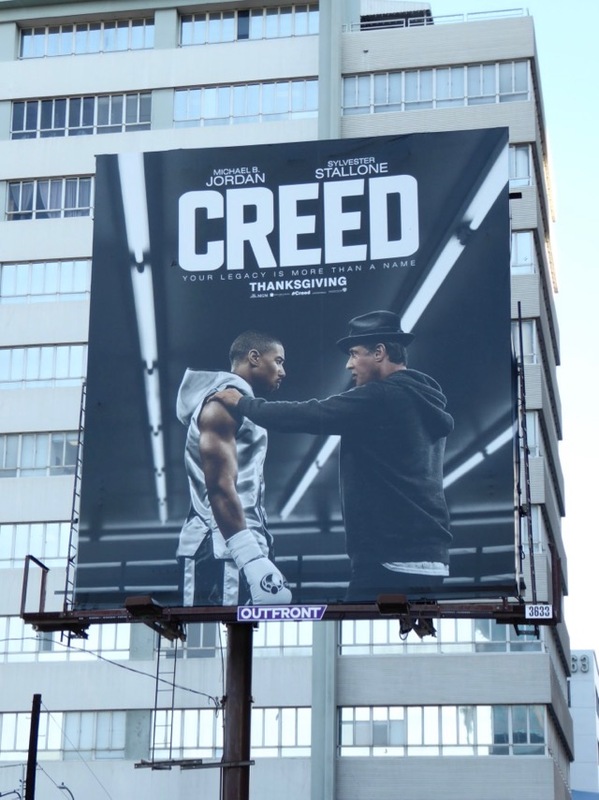 Meanwhile Sylvester Stallone fans can check out these billboards for The Expendables movies and these Grudge Match movie billboards. 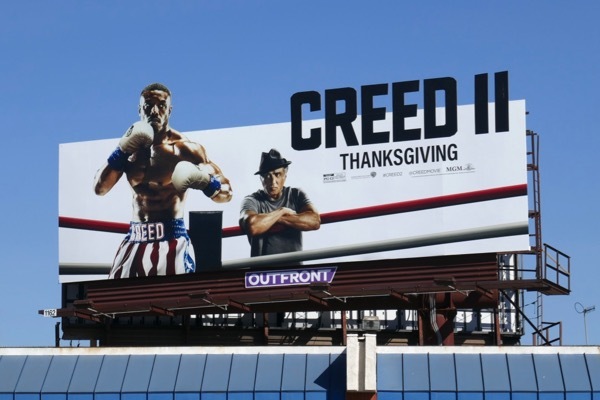 This outdoor ad campaign is certainly a knockout for the sporty sequel, so let's see if it punches above its weight at the box office this Thanksgiving. 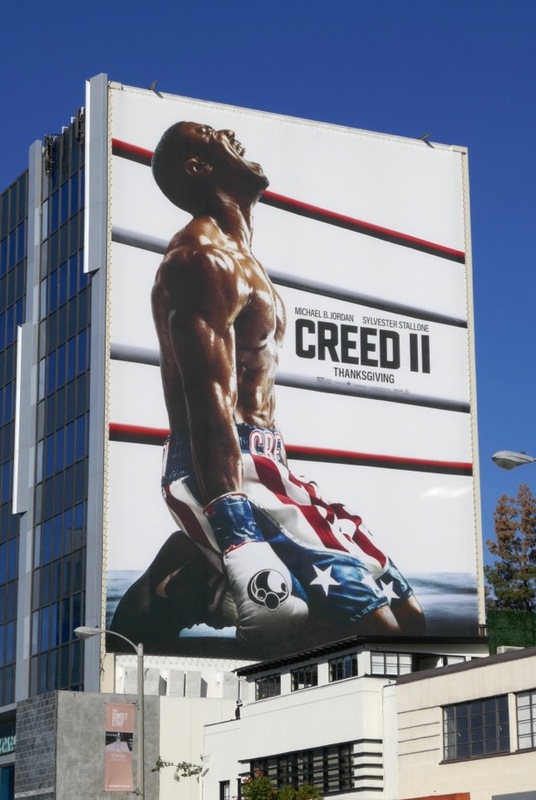 UPDATED: Creed II certainly seems to be packing a punch at the box office, opening with a strong $55.8 million. 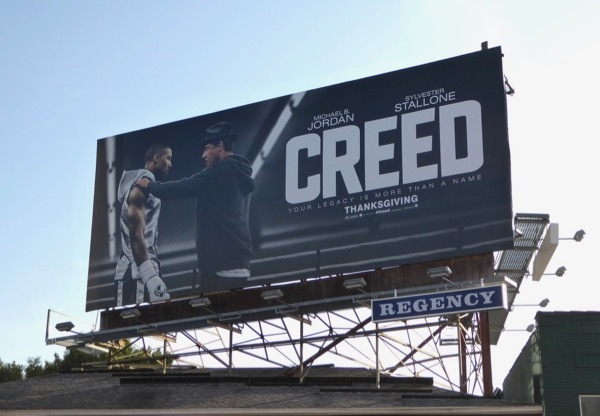 Here's another bold billboard for the movie sequel spotted along Sepulveda Boulevard on November 26, 2018. 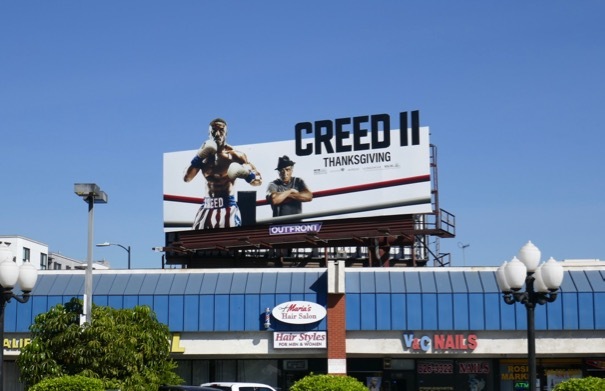 Plus here's also a great wildposting of Creed II street posters along La Cienega Boulevard on December 4, 2018.